Short History of Gold | Swiss America Trading Corp. SINCE the dawn of creation, gold has been held in high esteem as a store of value and a universal monetary substance in all civilizations. But why? Gold was greatly sought after in Greek and Roman times and throughout the Middle Ages. It is prized in the Middle East where it was used for the first time as money, and it?s also highly valued in China, Africa, the pre-Columbian America of the Aztecs and Incas, in the Russian Empire and even among the followers of Attila and Genghis Khan. Is this historic shift the result of the natural progression of human maturity? Is this the natural evolution of money, as Darwinian - Keyensian economists would say? In the words of former Fed economist John Exter, "Today?s U.S. dollar is nothing more than an IOU-nothing." Paper money retains only the symbol, or form, of its original substance - gold and silver. 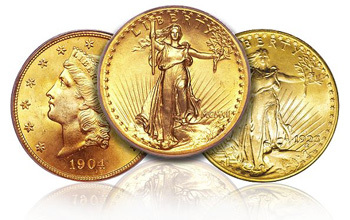 Let?s now examine the untold story of how and why the U.S. dollar was transformed from substance (gold) to symbolism (debt) - and what you can do to recover the substance while you still have time. Here is an example that may help you grasp why fractional banking is flawed. Imagine that you live on a small island with just one other inhabitant - a fractional-reserve banker. On the island there is only $1,000 in circulation total. Let?s say you decide that you want to start a fishing business, and visit your banker for a loan. The banker agrees to loan you $1,000 but must charge you $50 interest. That mean you will owe $1050. But wait, there is only $1,000 in circulation. Where will the other $50 come from? It must be created by the banker or you could never fully pay the loan back. This is the origin of inflation and devalues every other dollar in circulation. The Federal Reserve and the federal government are banking on Lenin?s conclusion - that the public will not become aware of this insidious process? until it is too late. "Centralization of credit in the hands of the State, by means of a national bank with State capital and an exclusive monopoly." "All the paper money issued today is Federal Reserve Notes. The real backing for the nation?s money is faith in the strength, soundness and stability of the U.S.economy." One can only deduce that the Fed believes that as America?s faith and confidence goes, so goes the economy. It is interesting that the root meaning of the word credit (credaria) is "to believe." It is true, we now have a monetary system purely based on faith - faith in a system that betrays us and our children. So, where do we go from fiat money? To virtual money - that is, pure credit transactions reduced to blips on computer screens. This new form of money gives the government total economic control over the populace - a goal many have long desired. Financial privacy is also forfeited in the process.